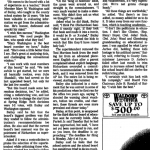 Collection of coverage from The Enterprise. 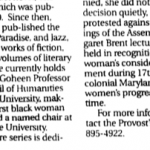 These articles are written by staff writers instead of letters from the public to the editor. Christine Mackinnon is a staff writer for The Enterprise. 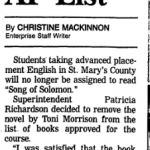 This article includes a quote from superintendent Patricia Richardson on her decision to remove the novel Song of Solomon by Toni Morrison. 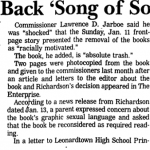 “I was satisfied that the book was not appropriate for high school students” – Richardson. 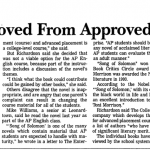 Richardson overturned the decision of a committee of parents and educators to keep the book on the list of those that may be assigned for AP English classes. When parents complain about a book school policy dictates that a committee is appointed to review the book and make a recommendation to the superintendent. 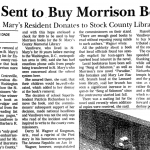 The committee’s determination was ignored and the book was removed. Mackinnon, Christine. 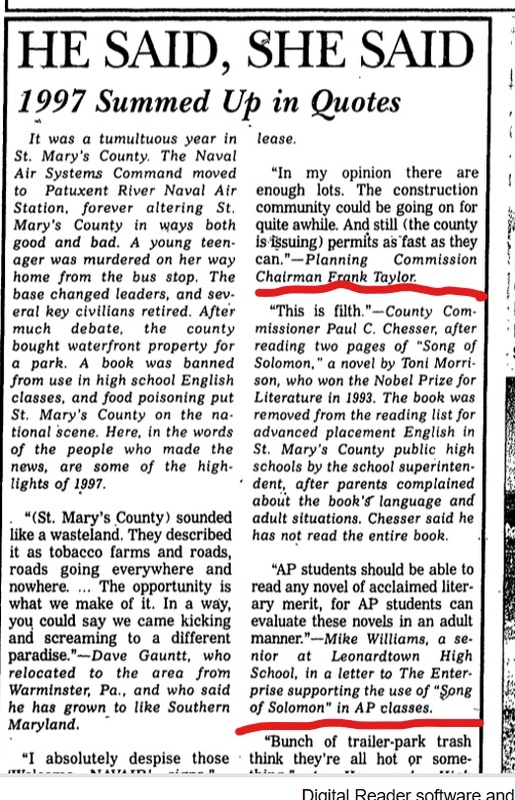 “Book Removed From AP List” The Enterprise, December 12, 1997. Editor. 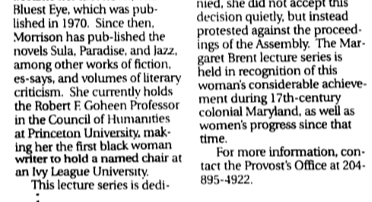 “1997 Summed Up in Quotes” The Enterprise, January 2, 1998. 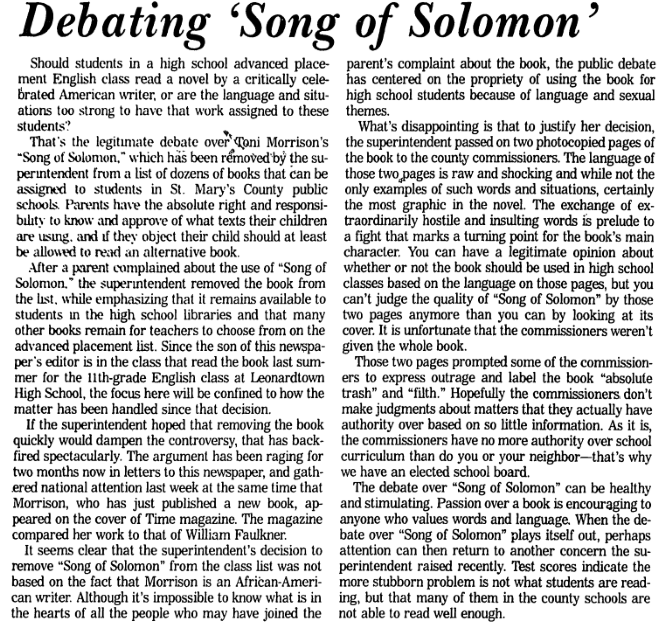 This article sums up the Commissioners support of banning Song of Solomon. 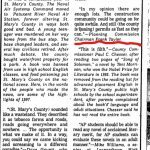 The Commissioner was shocked by the pages read. 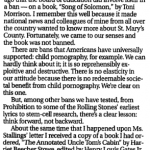 This also sums up previous letters to the editor. Dade, Jennifer. 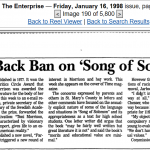 “Commissioners Back ‘Song of Solomon’ Removal” The Enterprise, January 16, 1998. Porter, Robert & Editorial Staff. “How Can We Expect Education if We Do Not Allow Education? 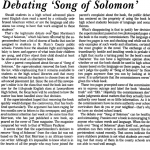 & Debating ‘Song of Solomon’ ” The Enterprise, January 21, 1998. Dade, Jennifer. 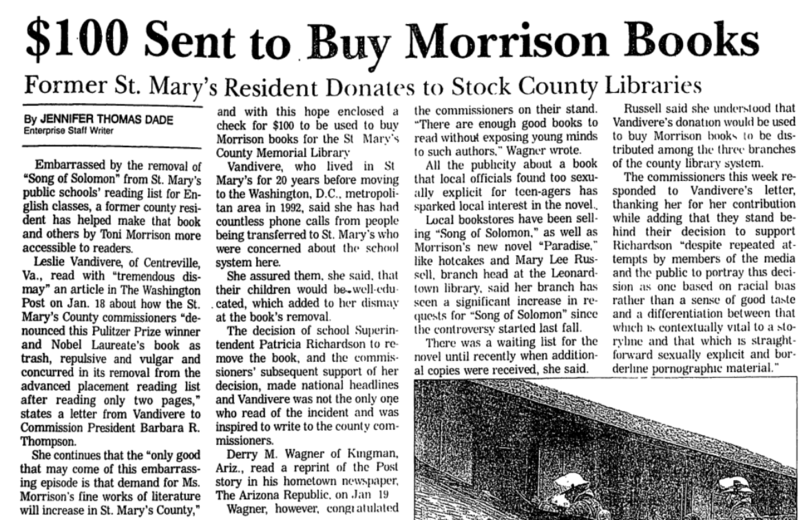 “$100 Sent to Buy Morrison Books” The Enterprise, February 6, 1998. Editor. 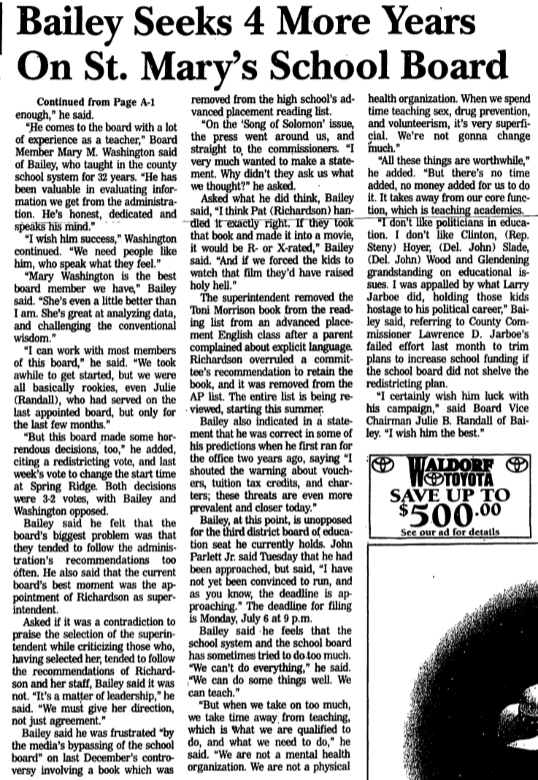 “Bailey Seeks 4 More Years On St. Mary’s School Board” The Enterprise, June 17, 1998. Editor. 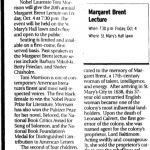 “Nobel Prize Winner to give Margaret Brent Lecture” The Enterprise, February 27, 2002. Editor. 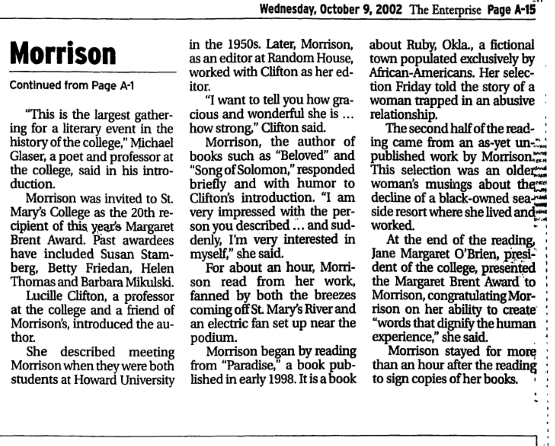 “Morrison” The Enterprise, October 9, 2002. Editor. “Feb. 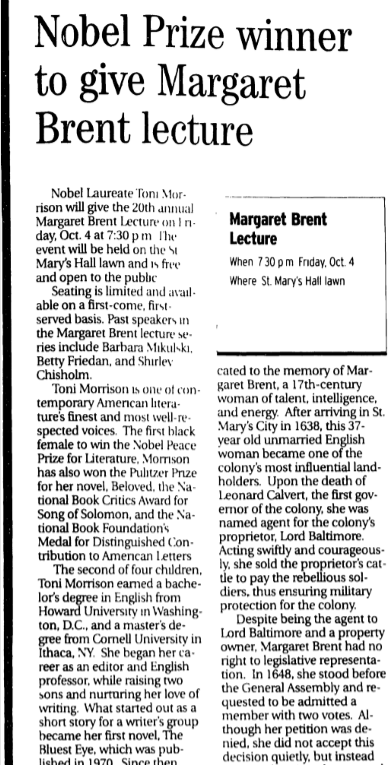 22 Lecture to feature history we need to know” The Enterprise, February 22, 2007.